The Office is destined for immortality with the help of internet-wide rewatch sessions and wild fan theories like this one proposed by the good folks at The Take. 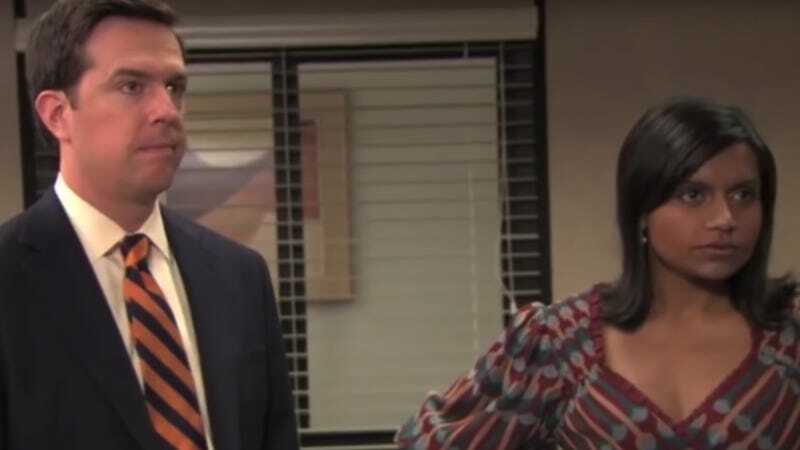 Both Kelly Kapoor (Mindy Kaling) and Andy “Nard Dog” Bernard (Ed Helms) can exchange some gnarly war stories about the disastrous love lives, but what if The Office’s biggest pop culture obsessed drama peddlers were actually meant to be together the entire time? The Take took 17 precious minutes to answer this dangerously reasonable question. The video breaks down their very amped dynamic throughout the series - which did not get a lot of screen time - in order to explain just why they are “two of the most compatible Dunder Mifflin employees.” Dwight and Angela fans might find that to be a bold claim, and they wouldn’t be wrong. It is bold, but it also happens to make a ton of sense. Sure, one could argue that concepts like “sense” and “reason” fly directly in the face of The Office’s entire essence, but it’s still worth examining. The mere thought of watching their two intensely dramatic personalities interact for extended periods of time sounds exhausting at first. But as the clip believably argues, it’s actually their extreme, youthful appreciation of grand gestures, pop culture, and their somewhat shallow ideas of success that make them an ideal pair. There are actually moments throughout the series where they express, at minimum, a mutual curiosity, which they never have a fair chance to explore. Also, Andy would likely be the one to give Kelly the majorly public displays of love she often fantasized about while Nard Dog would finally have an enthusiastic fan to hype up his love of performing. It’s a hypothetical that is only as odd as the idea of either of these two winding up in a healthy relationship. Otherwise, it actually works. And truly, anything is better than Ryan Howard, Kelly.